The Hedgehogs are made ostensibly for what the North Face call "Fast-paced outdoor activities" - at first this worried me that they were aiming the shoes at hikers and ramblers (in a hurry), but not at runners, however after my first outing i have to say that these will suit whatever your speed. The shoes are light enough for trail running, whilst being stable and rigid enough for climbing and scrambling across rocks. 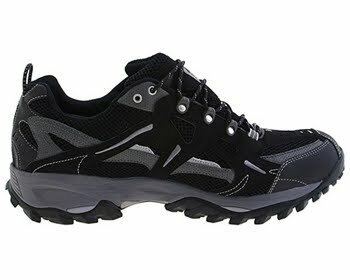 The sole is peppered with a very rugged and spiky Vibram outsole (hence the nick-name), which seems to grip in even the boggiest of trails and with the bonus of a waterproof Gore-tex upper and padded tongue makes the ride easier and more pleasant than other off-road shoes i have used. I ran in a 30 mile trail race this weekend in them (Doyen of the Downs) and due to a combination of the recent weather we have had and heavy rain the night before they were thoroughly tested, handling very well in the churned ploughed fields as they did on the compact trails (not that there were many of those) and roads. The sole being as hard wearing and rugged as it is doesn't seem to have a much cushioning as some heavier runners would like and is definitely more of an off-road shoe than a road/off-road shoe, but handles very well on all surfaces. The Gore-tex uppers are brilliant and the only time that water actually got into the shoe was after my foot had been totally immersed over the ankle in a nice deep dirty puddle. Still finished the race without sore feet or any new blisters from the race and better still dry feet (well... foot). My only complaint (albeit my own preference) is that i would have liked lace-locks with the shoes as the laces supplied are very thin and not easy to tie tightly to prevent the shoes coming off in very sticky conditions, and needed re-tying several times on the run, but baring that i am very happy with what The North Face have created and looking forward to getting them even muddier (if possible) in the winter weather. I've had a similar complaint about the laces and that's just from walking in them. Otherwise they're excellent and perfectly waterproof.